Featuring a dynamic design and a wealth of features, Issues & Controversies helps researchers understand today’s crucial issues by exploring hundreds of hot topics in politics, government, business, society, education, and popular culture. Our Issue and Article pages make it simple to see all of the available content in one place; thousands of editorials and opinions from renowned newspaper sources via NewsEdge keep researchers on top of trending topics; and our enhanced navigation and search results and improved organization and taxonomy give users an intuitive and user-friendly research experience. Updated weekly, with an extensive back file, Issues & Controversies offers in-depth articles—each presenting both sides of an issue clearly, coherently, and without bias—made to inspire thought-provoking debates. Its straightforward presentation of the key facts, arguments, history, and current context of today’s most important and timely issues makes the database an ideal resource for research papers, debate preparation, and persuasive writing assignments. The articles are written by our own expert writers and editors, and each article includes a full range of supporting materials. Extensive, objective, and comprehensive coverage: Issues & Controversies features timely, in-depth articles covering complex, hot-button issues in politics, government, business, society, education, and popular culture. Designed to inspire thought-provoking debates, each article presents both sides of an issue clearly and without bias. Pro and con statements: Each Issues & Controversies article presents clear pro/con statements that highlight the main arguments on each side of the controversy, presenting a quick, balanced, and succinct synopsis from supporters and opponents and allowing users to explore all of the controversies related to each issue in one place. Original videos and educator support materials: Selected hot-button issues in Issues & Controversies feature overview videos to introduce the topic and exclusive Educator Resources to extend the lesson beyond the articles. Educator Resources include overviews, learning objectives, printable handouts (such as self-assessments with answer keys), discussion questions, and much more. Debate videos: Issues & Controversies includes compelling, thought-provoking, Oxford-style debate videos from the renowned Intelligence Squared U.S. Debate Series, featuring some of the most prominent political figures, journalists, academics, and experts in the United States and throughout the world on a wide range of crucial topics in areas such as crime, law, and justice; economy, money, and business; education; energy and the environment; families and youth; global issues and world affairs; government and politics; health and medicine; race, rights, and liberties; science and technology; and society and culture. Editorials: For a broader perspective on contemporary events and conflicts, Issues & Controversies features thousands of editorials and opinions via NewsEdge from prominent newspapers and magazines worldwide and across the political spectrum—including the New York Times, Wall Street Journal, Chicago Tribune, Los Angeles Times, Washington Post, Miami Herald, Houston Chronicle, Toronto Star, Jerusalem Post, China Daily, Guardian, Atlantic, Nation, and Weekly Standard. Audio content: Issues & Controversies features editorially curated and selected National Public Radio (NPR) audio recordings and podcasts—including episodes of NPR’s Fresh Air and On Point—linked directly to specific articles to enhance context, understanding, and research. Along with the original recordings, many feature transcripts of the entire broadcast or selected highlights. Infographics: Issues & Controversies includes more than 150 stand-alone infographics, presenting vast amounts of information in easy-to-access charts, graphs, and tables that make it simple for users to visualize statistics and quickly grasp essential ideas. 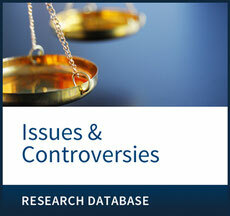 Rich related resources: Issues & Controversies contains a topic-based Reuters® news-feed, editorial cartoons, timelines, primary sources, speeches, congressional testimony, newspaper editorials, and discussion questions and activities that prompt researchers to do their own critical thinking and analysis. - Educator tools, including advice on assessing students’ speeches and interviews, exploring point of view with students, holding a town hall meeting, preventing plagiarism, using editorial cartoons in class, and debates. Primary sources: Issues & Controversies includes original documents with introductory paragraphs that provide context and background to the sources—perfect for document-based learning and strengthening critical-thinking skills. Full coverage of each National High School Debate Topic: The National High School Debate Topics section of Issues & Controversies includes comprehensive articles on every annual debate topic since 1997, covering such critical issues as alternative energy, domestic surveillance, and national infrastructure. Bill of Rights in Debate: Many of the issues covered by Issues & Controversies deal with constitutional questions; however, the various sides in a debate often interpret what the Constitution says differently. The “Bill of Rights in Debate” section deepens understanding of the U.S. Constitution in contemporary life by linking Issues & Controversies articles directly to constitutional rights. Presidential Elections and Administrations: Issues & Controversies provides comprehensive background articles on all presidential races since 1996—including articles about the candidates’ views on campaign issues, party platforms, and excerpts from convention speeches—and the presidencies of Reagan, Clinton, Bush, Obama, and Trump.